UNO’s payroll area creates timely, accurate, employee wage payments. We provide support through training, managing workers' compensation claims, unemployment claims, employee or independent contractor designations, crisis leave administration and garnishments. We strive to provide the latest payroll processing technologies promoting, updating and supporting effective, efficient improvements. Staff assistants and/or Business Managers may hold the same responsibilities at UNO. It depends upon how the individual unit manages its administrative activities. This time tracking method is for hourly and/or temporary employees. This time tracking method is for hourly (bi-weekly) full-time and part-time employees. We use SAP's "Record Hours Worked" software. If an employee plans to work more than 40 weekly hours, they will need permission from their supervisor before working the extra hours. Download Comp Time Authorization Agreement. Overtime or compensatory ("comp") time are only awarded for time worked more than 40 weekly hours. Sick, holiday, vacation, and other non-worked hours are not counted toward hours worked, but are paid at the regular rate of pay. Overtime and compensatory time are earned at 1.5 the regular hourly rate. UNO uses a direct deposit system for employee paychecks. Contact the Office of Human Resources to make changes to one's bank or to get a form to designate the bank location for the direct deposit. You may also change your bank information in Employee Self Service (ESS). The university encourages everyone to select receiving their W2 forms online–it’s safe, convenient, and environmentally friendly. 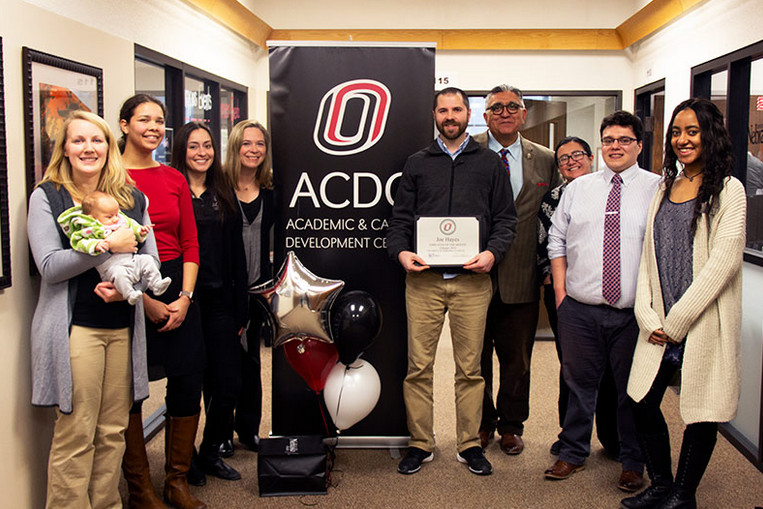 Joe Hayes, Assistant Director of Employer Relations in the Academic and Career Development Center, was recently named UNO’s Employee of the Month for February. The Prize Patrol surprised Joe with the award and refreshments on Feb. 5, 2019. Joe was nominated by his peers for his rich experience and dedication to office clients. For being nominated as Employee of the Month, Joe will receive a certificate, lapel pin, hot/cold tumbler, portrait, monetary award, two tickets to a UNO sporting event and use of a designated parking space. To nominate an employee, print and complete the nomination form and send it through campus mail to the Office of Human Resources, 205 EAB. Employee of the Month nomination information.